FREE CONE DAY AT BEN & JERRY'S!!! 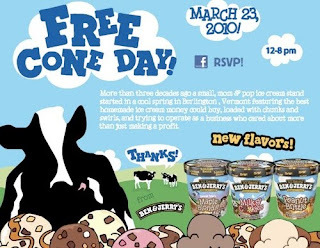 Tomorrow (Tuesday, March 23rd) is Free Cone Day at select Ben & Jerry's Ice Cream Stores! And you don't have to get your ice cream in a cone either! You can eat it in a cup and enjoy a nice gluten free dessert! As always, be sure to check the ingredient list that is provided at Ben & Jerry's stores to make sure the ingredients have not changed and are still gluten free. Let's Go To Caracas Arepa Bar! Have you ever tried an arepa? Do you even know what one is? Well, it's a gluten free bread that is very popular in both Columbia and Venezuela! Typically, it is made out of ground corn, water, and salt. If you are in the New York area then you are in luck because Caracas Arepa Bar has a location in NYC's East Village and in Brooklyn where they serve delicious gluten free arepas! The selection of arepas that they have to choose from is rather extensive. I tried the De Pollo (photographed above). 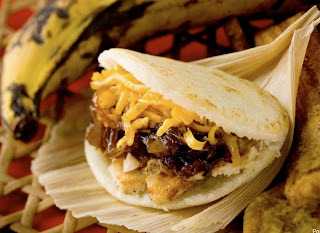 This arepa is filled with a grilled chicken breast with caramelized onions and cheddar cheese. It was amazing! Just make sure to not get the arepas that contain fried items or the plantain chips as they are fried in oil that is also used to fry wheat products! Caracas Arepa Bar is open everyday from 12 noon to 11 pm. On the weekends, there is usually a wait. However, you can always choose to order takeout/delivery instead of waiting for a seat. For those of you that love ice cream but are trying to eat healthy, then Skinny Cow is the perfect choice! All of the current bars that Skinny Cow sells are gluten free. This includes their classic Fudge Bars and Mini Fudge Pops along with their French Vanilla, Chocolate, Caramel, and Whole Mint Truffle Bars and their Vanilla & Caramel and Vanilla & Mint Dippers! In addition to being gluten free, Skinny Cow bars are kosher and low fat. They make for the perfect dessert! 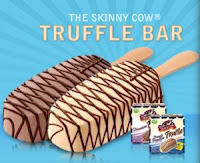 Skinny Cow products are available at most grocery stores! For more information, please visit www.skinnycow.com.